As heat waves, fires, floods, storms, drought continued to hit the headlines in July, Kuwait tied the world’s highest known temperature at 129.2 degrees (54 Celsius) at the end of July, while one month's rain fell in two hours and destroyed Ellicott City maine street in Maryland killing two, along with 40 dead from lightning strikes in Odisha, India, 50 people dead or missing from landslides in Nepal. More than one years rain fell in less than a day in China, killing 225 with a further 225,000 trapped. A deadly Texas heat wave killed four, while heat waves in Europe climbed above 40C, 105F. A new record, as ten thousand lightning flashes lit up Hong Kong's night sky in July, hundreds killed in torrential rains in India.. the records just kept tumbling. This was the 15th month in a row to break a monthly heat record, surpassing July 2015 as the warmest month ever on record. Records date back 137 years to 1880. 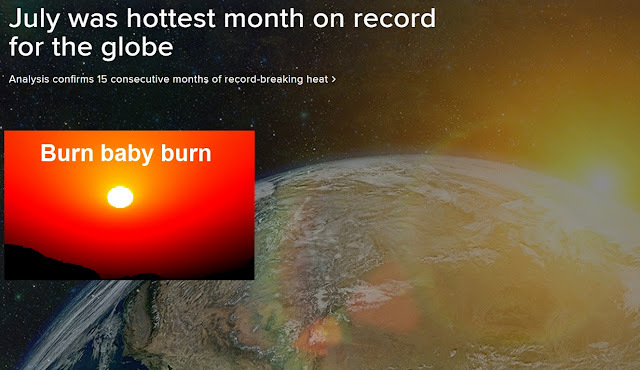 For the year to date, the average global temperature was 1.85 degrees F above the 20th-century average. This was the highest temperature for this period, breaking the previous record set in 2015 by 0.34 degrees F.
The average Arctic sea ice extent for July was 16.9 percent below the 1981–2010 average. This was the third smallest July extent since records began in 1979.